Jason Plato has laid down a significant marker in the opening BTCC practice session at Donington Park by setting a lap time more than half a second quicker than the rest of the field. The opening action of the weekend commenced under beautiful spring sunshine in what can only be described as perfect conditions for this time of year. Installation laps and tyre scrubbing consumed much of the early running, before West Surrey Racing’s Sam Tordoff produced the first representative time of the morning. The big boys were soon out to play and it was the ballast-free MG of Andrew Jordan who set the pace shortly after mid-distance. The combination of Jordan and MG should go well here with the former having won at the Leicestershire circuit during his 2013 title winning campaign, whilst his new machine was the dominant force in the hands of Plato and Tordoff last season. Four different marques filled the top five positions with 15 minutes to go with the VW of Aron Smith and Gordon Shedden’s Honda sitting behind Jordan in the timesheets. The two Mercedes’ of Adam Morgan and Aiden Moffat were fourth and fifth respectively before the session was halted. Whilst contact in the BTCC isn’t a rarity it is not often seen in a practice session, but that was the unfortunate situation that both Jack Goff and Hunter Abbott found themselves in. Whilst Goff was clearly frustrated it will be down to the stewards to decide who was at fault in the incident. Both cars suffered damage while the session was stopped for a lengthy period to recover the beached Audi A4 of Abbott. Restarting with ten minutes on the clock it was Plato who made his move by producing a series of flying laps. 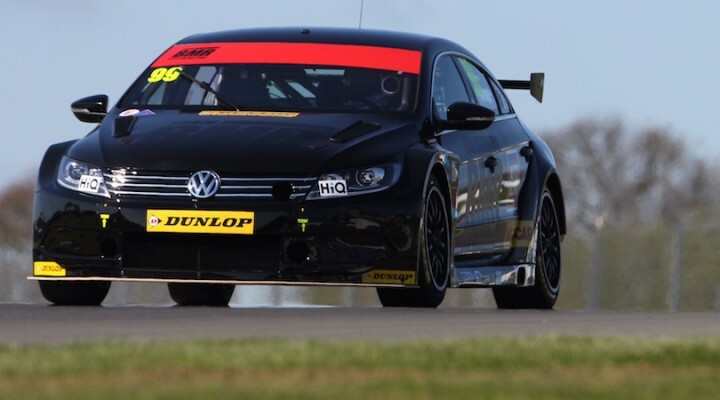 It came as little surprise with the double champion having set the pace here in pre-season testing, as well as his VW running without success ballast today due to indifferent results in the curtain raiser at Brands Hatch. What may have come as a surprise, however, was the impressive 1:09.665s lap time – providing an ominous warning to his rivals with seemingly more performance left in the Team BMR machine. The new Honda Civic Type R continues to run well with Gordon Shedden claiming second late on ahead of Jordan. Colin Turkington made it four champions in the top four while his BMR team-mate Smith completed a hat-trick of VWs in the top five. Morgan and Moffat maintained their challenge until the finish while Tom Ingram’s Toyota edged out the two Chevrolets of Josh Cook and Dave Newsham, albeit confirming impressive top ten results for the Power Maxed-backed duo.